You are certainly familiar with the Hylas 46, 49 and 54 as they are among the most sought after boats in our times. 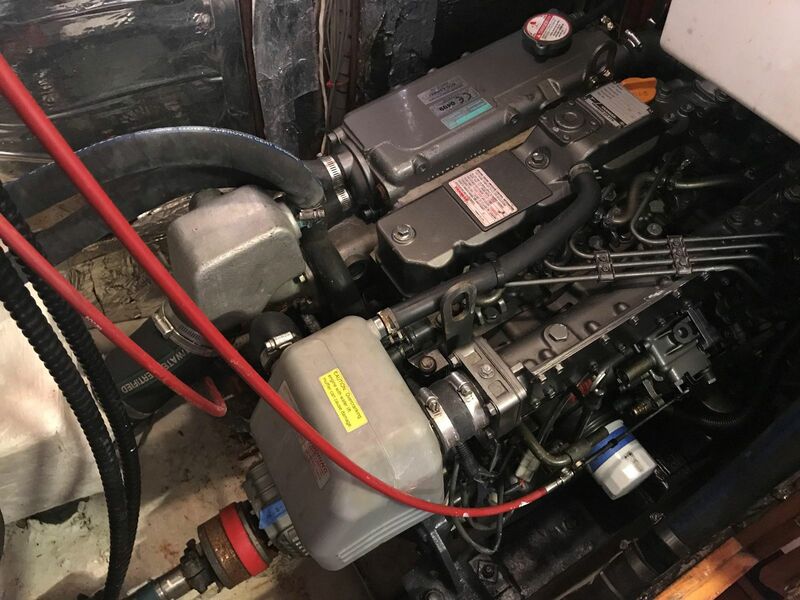 But, you may not be as familiar with the Hylas 44 that started it all. The Hylas 44 was designed by German Frers and built by Queen Long Marine in Taiwan from 1984 to 1992. 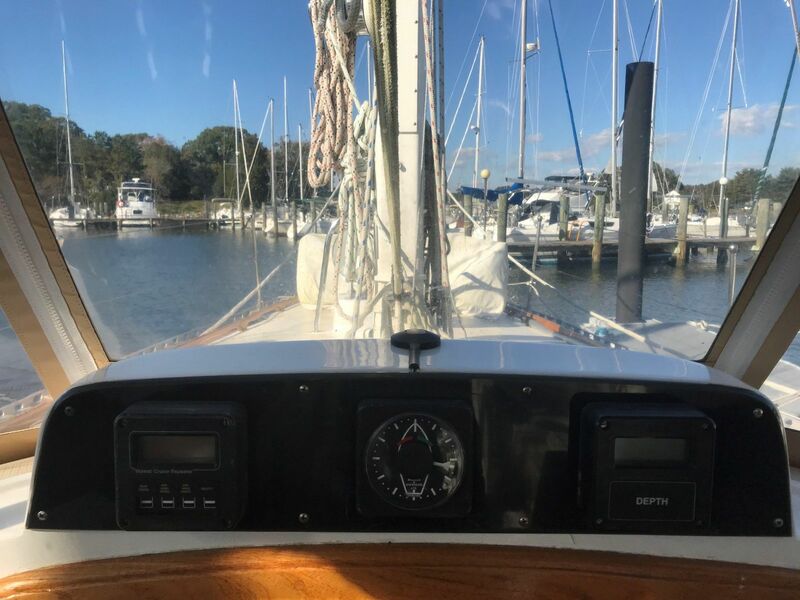 This is a center cockpit offshore cruiser was built with the charter trade in mind as a comfortable ocean going cruiser that was easily sailed by a couple. They became very popular as a commodious two stateroom vessel with a beautiful center cockpit and scooped transom for enjoying the Islands. 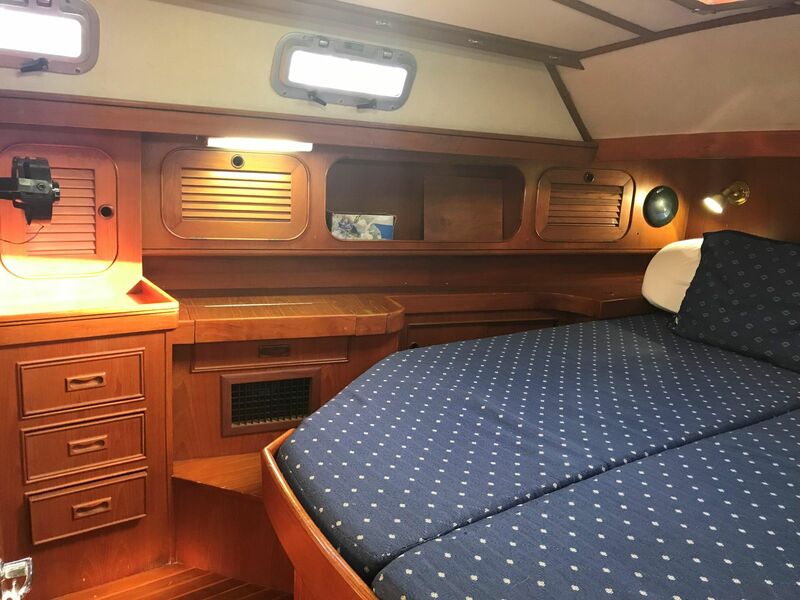 The Hylas 44 was indeed the predecessor of the 46 and 54 with the beam carried well aft to provide that beautiful aft stateroom.. 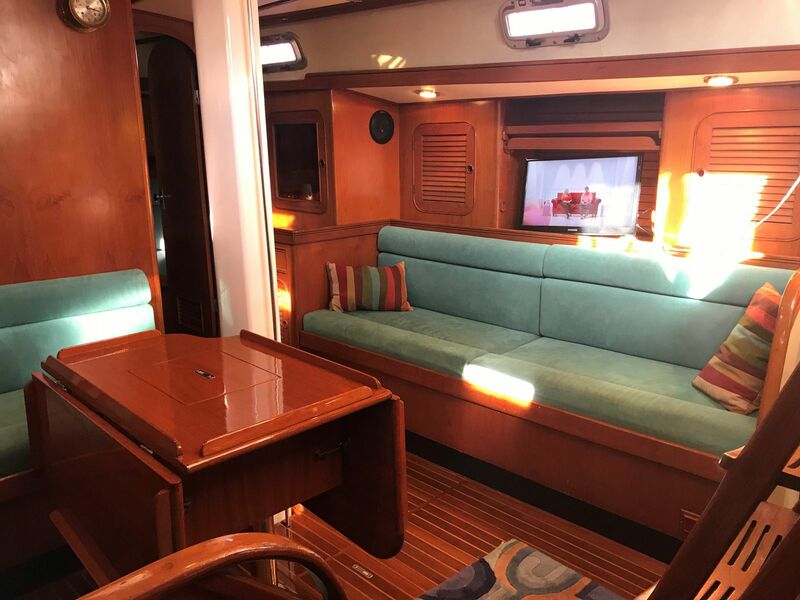 The interior is one of the lovely features of the Hulas 44 because it was really designed as a perfect charter boat for two couples or a family. They have an offset double berth forward that has a small settee and a private head and shower. 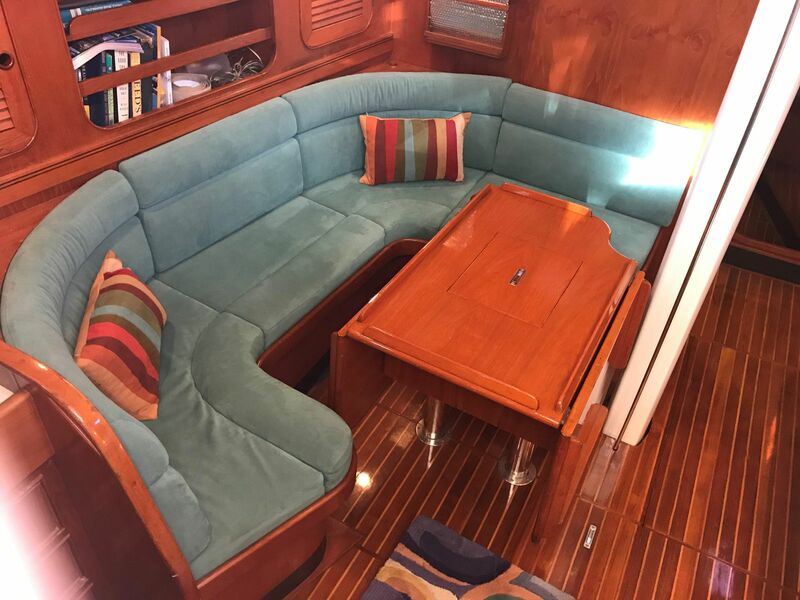 The main salon has a lovely rounded dinette arrangement to port with a classic straight settee to starboard. The master stateroom aft has its own ensuite head and shower. The dual walk-throughs proved to be a popular feature so one can access the aft stateroom without disturbing the galley slave. 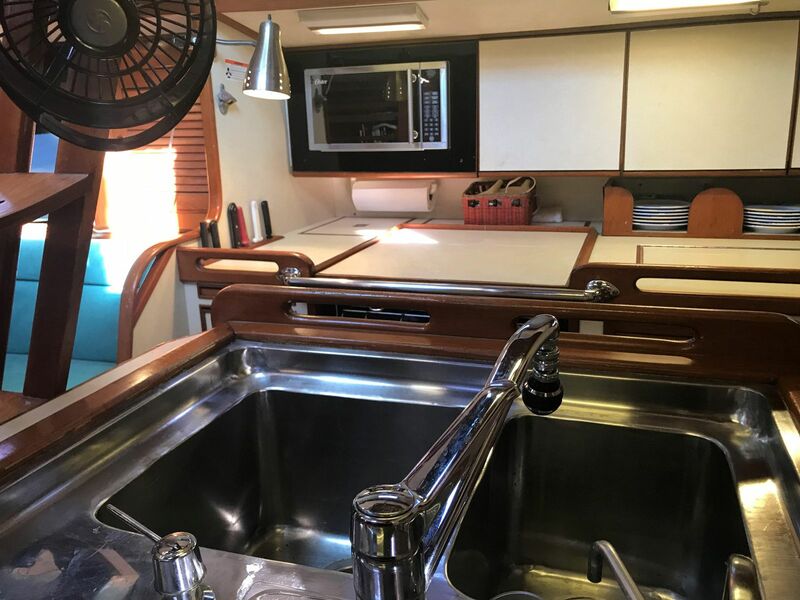 The galley is laid out on the starboard side with the master head and shower on the port side. 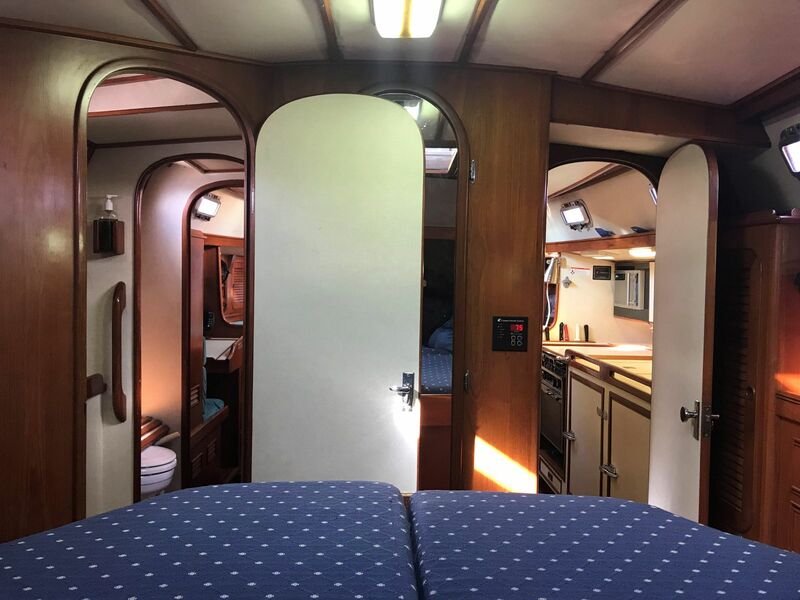 The master stateroom has a centerline queen on all except the first thirteen hulls which had a berth offset starboard side. 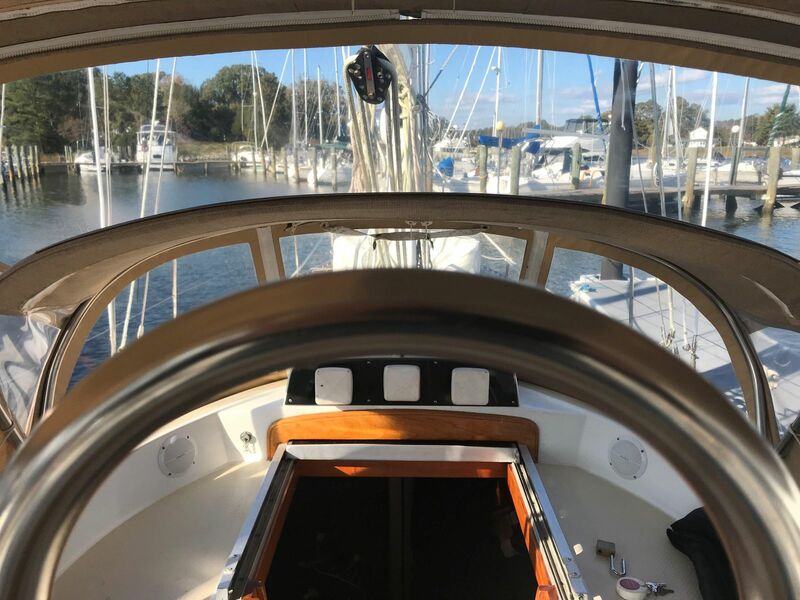 The build quality is there with a solid hand laid fiberglass hull and a network of full length fore and aft stringers and transverse flooring. 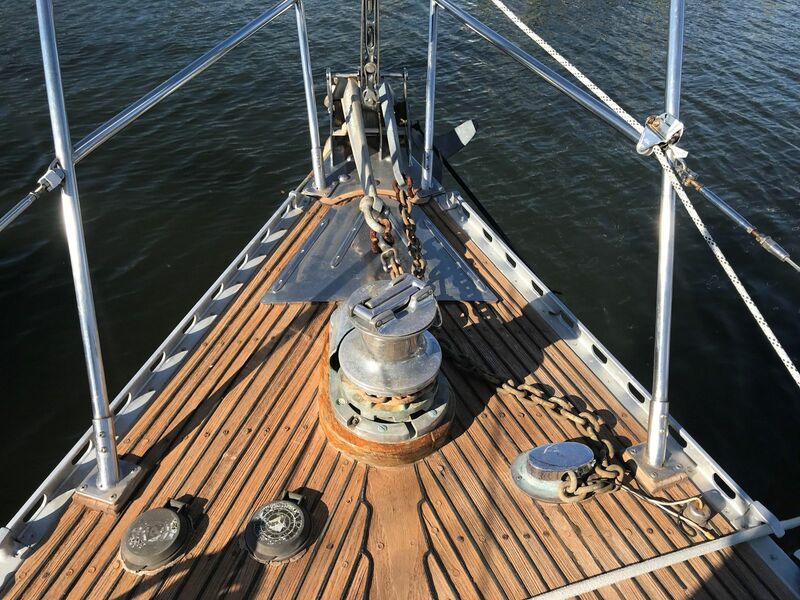 The deck is a fiberglass sandwich cored with balsa in the eighties, fastened to the hull with 5200 and though-bolted with stainless bolts. The chainplates are massive and they tie into glassed over stainless steel I-beams. It is with pleasure that we offer you our latest offering the Hylas 44 “Obsession”. 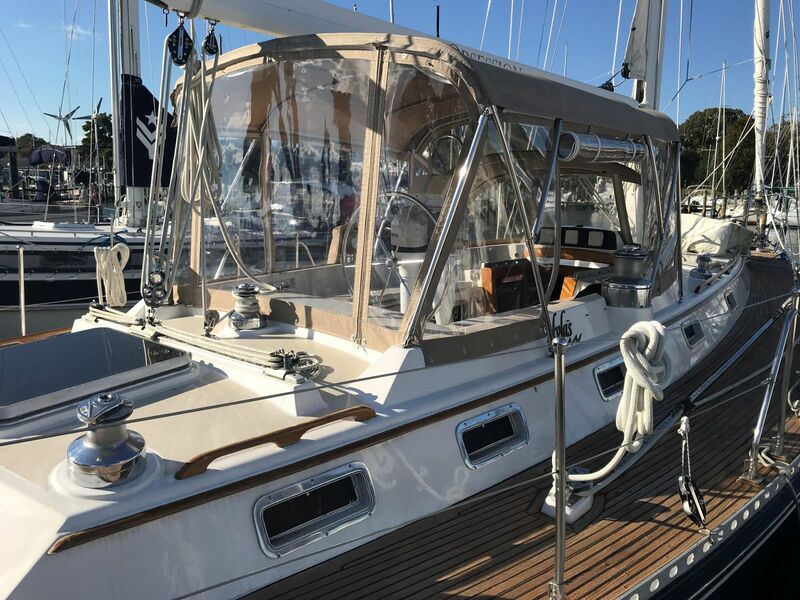 This 1987 Hylas 44 is very special as she was never in charter. 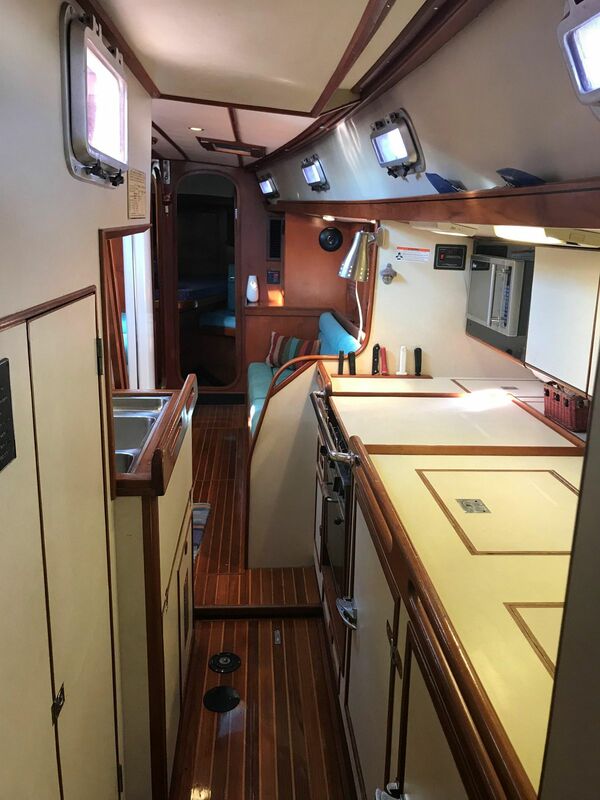 She also had an extended sugar scoop transom added making her more like the popular Hylas 46. 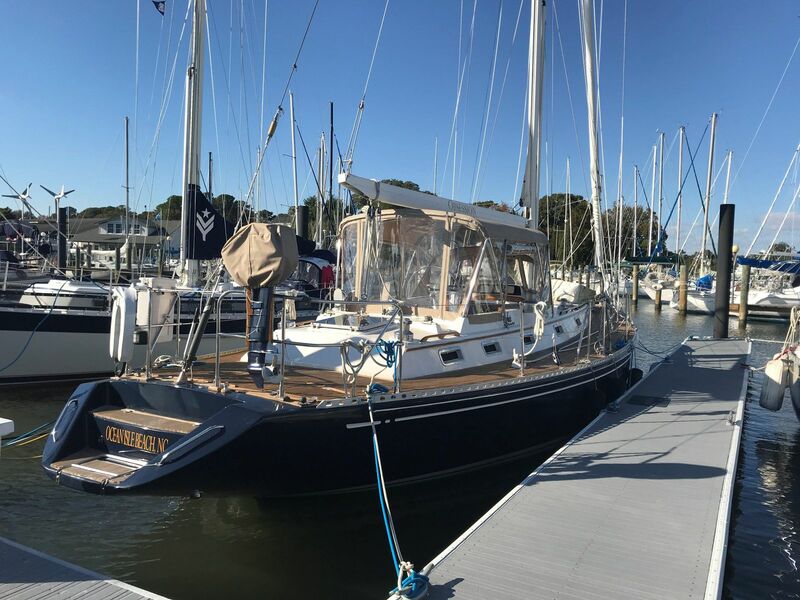 Her first owner’s kept her in the Caribbean where she was on the hard during each hurricane season. They enjoyed many winters cruising in the Caribbean. The second owners purchased the boat in 1999. The first owners had her shipped to Ft Lauderdale and then spent winters in the Caribbean! They stored the boat on the hard in summers. 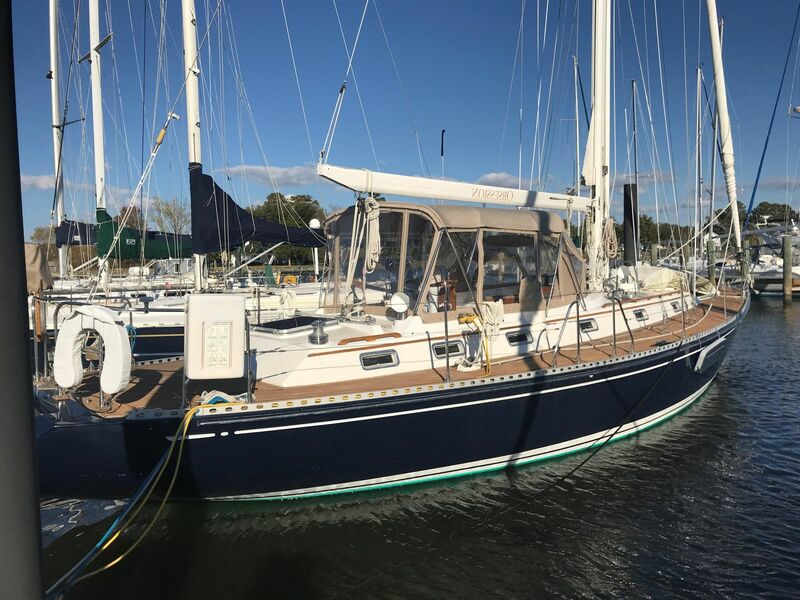 The current owners purchased their Obsession in January of 1999 and sailed to the Chesapeake Bay. At 12 years old, she was due for a refit and Hartge’s Yard in Galesville was the perfect yard for the job. The new owners had the transom extended in 2000. 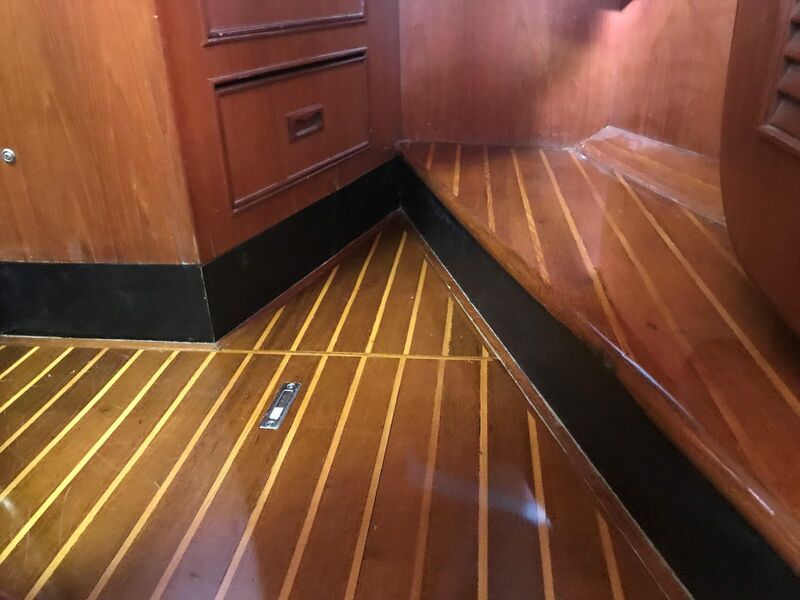 The mold for the transom extension was actually created by Queen Long Marine for the Hylas 46. 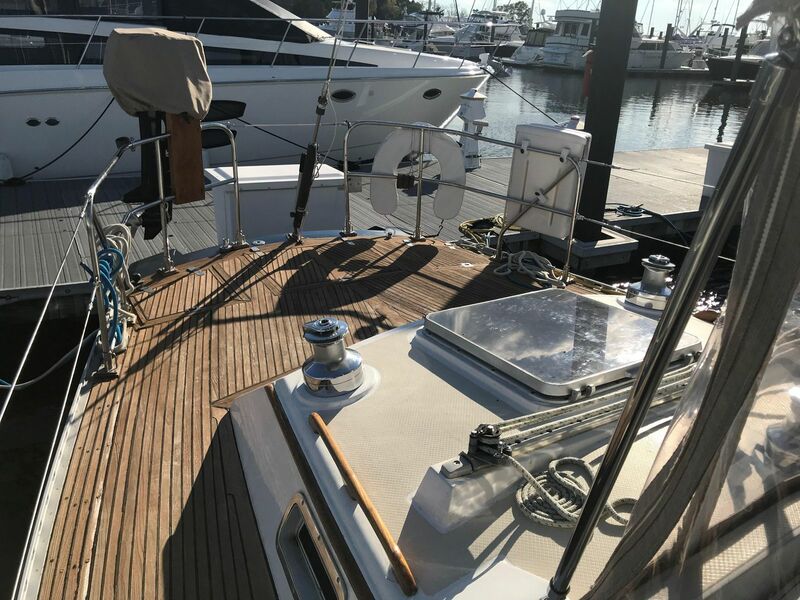 The popularity of the Hylas 46 made this a sought after feature. 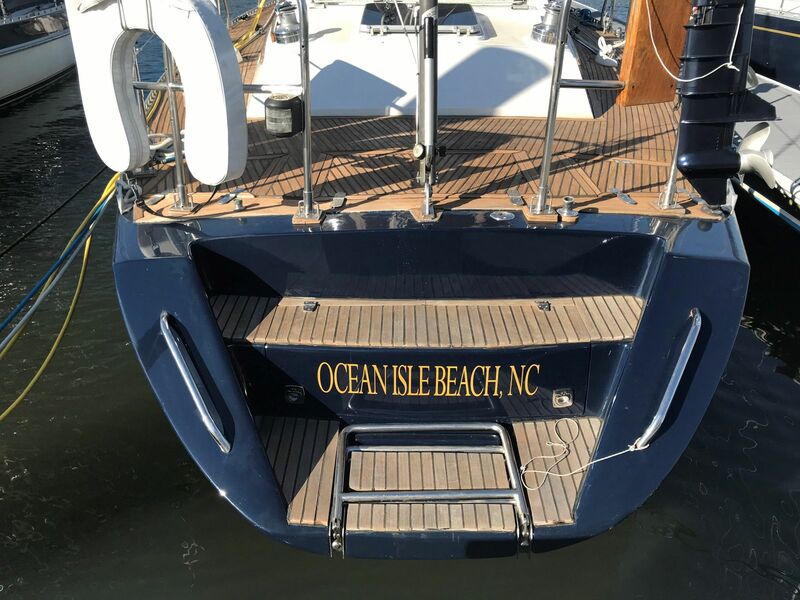 The new owners also had the topsides painted a beautiful Flag Blue. Hylas accommodations are among their most attractive feature. 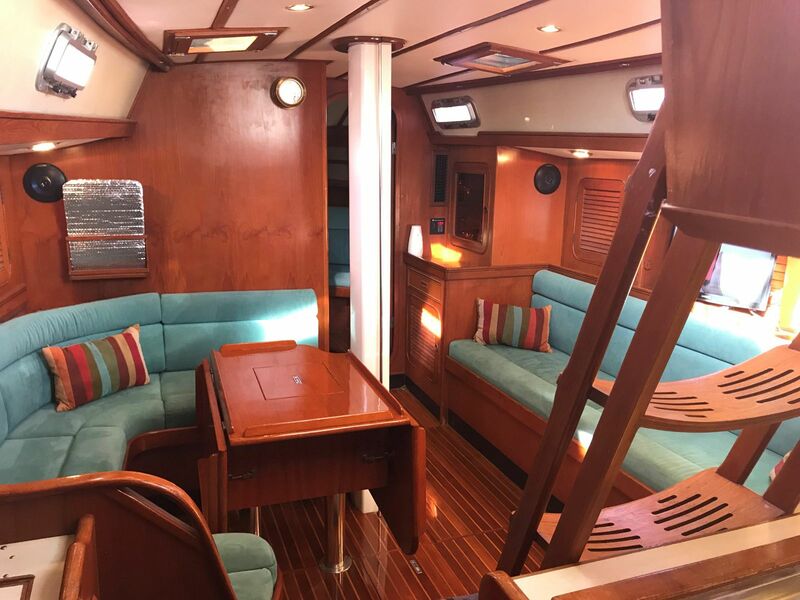 The Hylas 44 is the predecessor of the Hylas 46 which is sought after for her lovely interior. 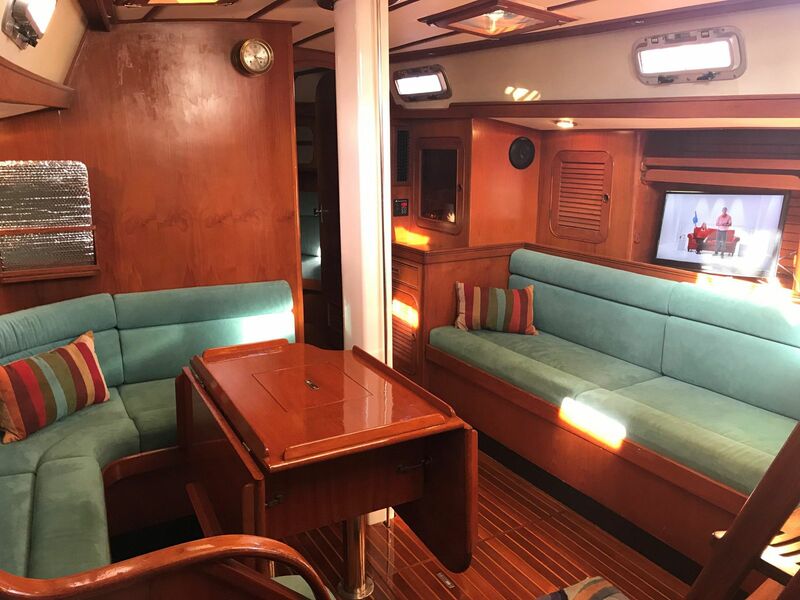 The Hylas 44 is a similar two stateroom layout center cockpit boat with a lovely salon and walk through galley. 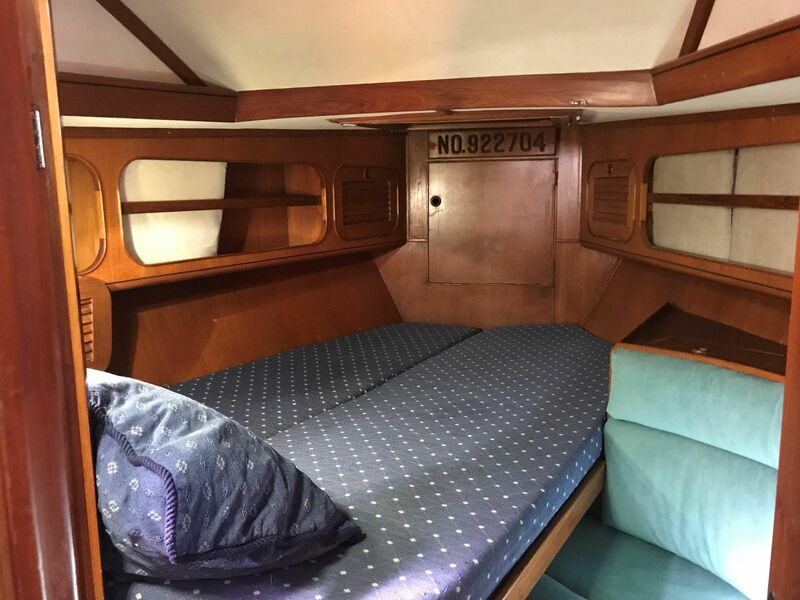 Up forward, there is an offset berth and settee as well as a hanging locker, four overhead lockers, and three large drawers for more stowage. This guest cabin is a real stateroom with a private head and shower. 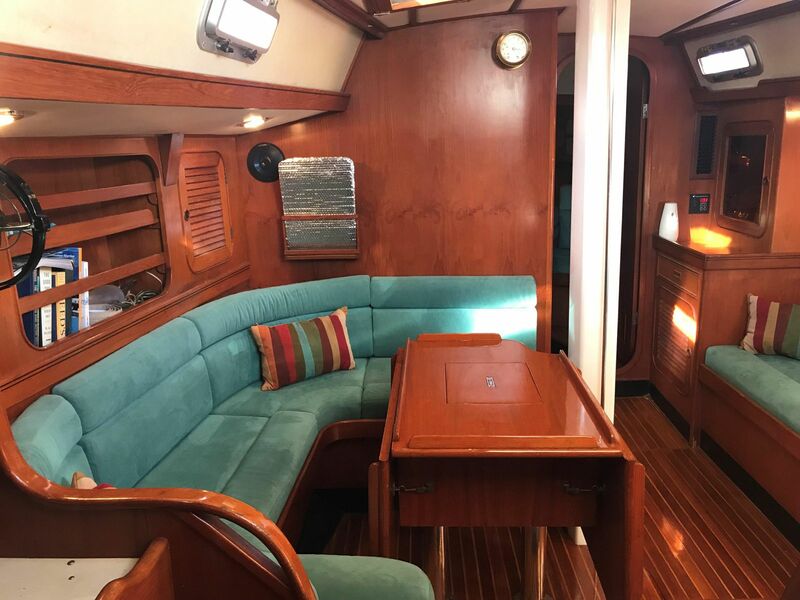 The main salon includes a dinette arrangement to port and a starboard settee. The beautiful sought after aft master stateroom is accessed either through the galley or the owners aft head. The dual walk-throughs were a tremendously popular feature and still are. In the aft stateroom there is a fabulous centerline queen berth. The owner's stateroom has plenty of stowage in two hanging lockers, many wall lockers and also under berth drawers. 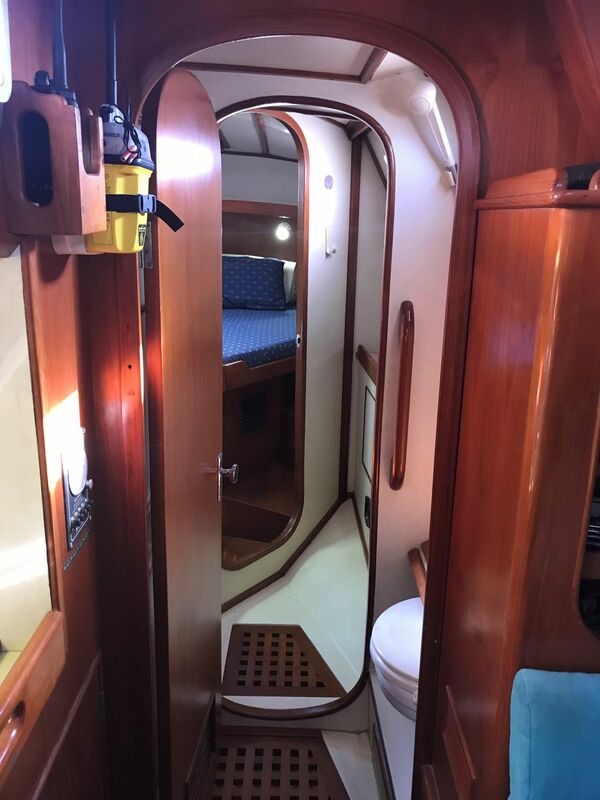 The owner's aft stateroom has it's own ensuite head and stall shower. 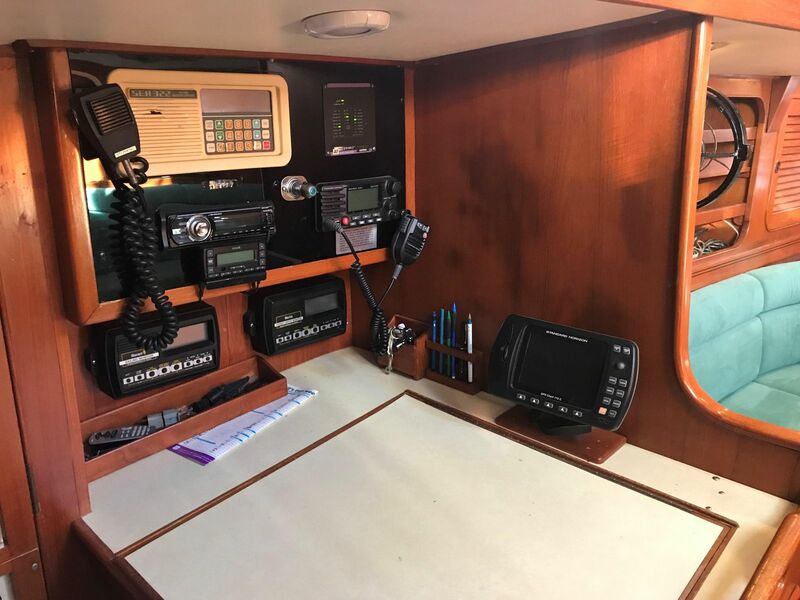 The galley is loved and it is a safe and secure galley at anchor or in a seaway. 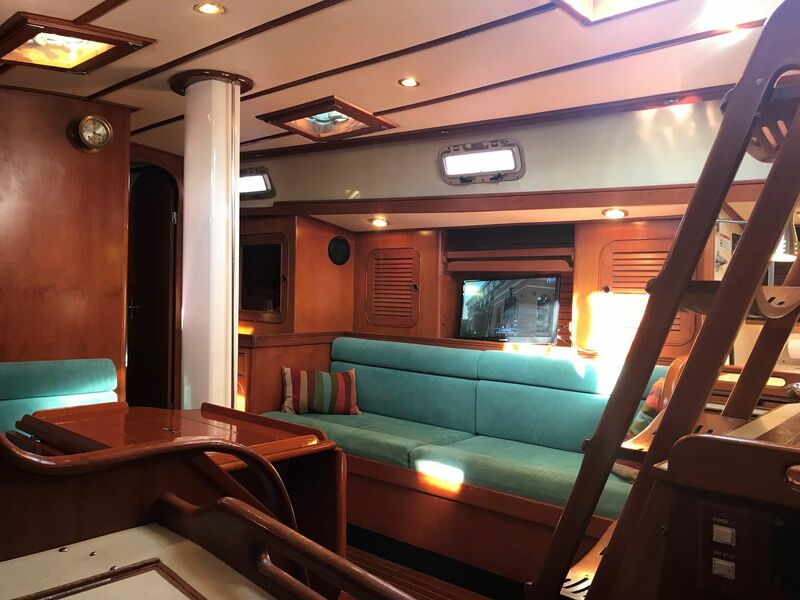 The main salon is lovely with a dinette arrangement to port and a straight settee to starboard that also makes a good sea berth. The dining table is a traditional drop leaf table that extends port and starboard to seat six easily and maybe more. There is lovely cabinetry outboard including a nice liquor cabinet and shelves. The headroom is huge and it is a big plus for tall sailors. Some say it is seven feet. I'd say it is likely easily 6'6'. It accommondates! 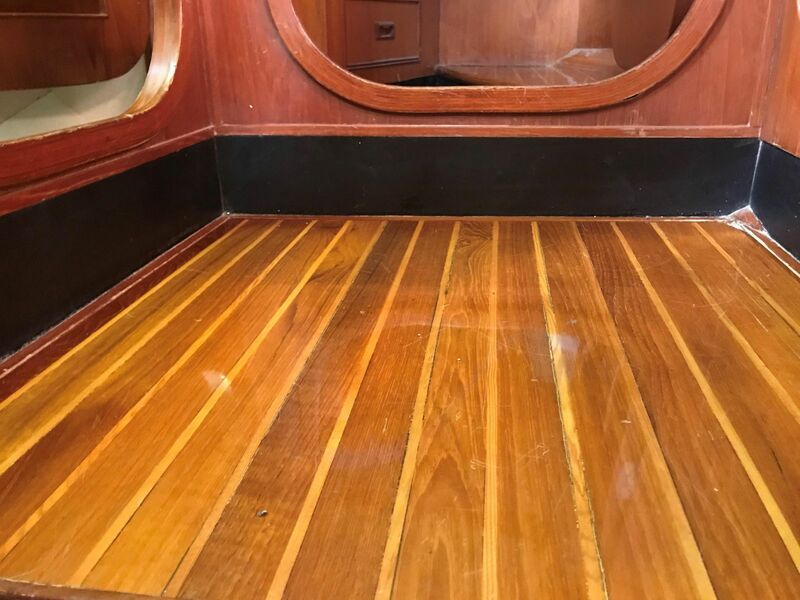 The interior is lovely of teak with a beautiful teak and holly cabin sole. The Ultrasuade upholstery is teal and looks pretty with the teak. The lighting is nice with a combination of LED, halogen and fluorescent (some dimmable). It's very nice. You'll be pleased. Create comforts include the entertainment the flat screen TV and Sirius Radio with the speaker system. You just need your subscription. 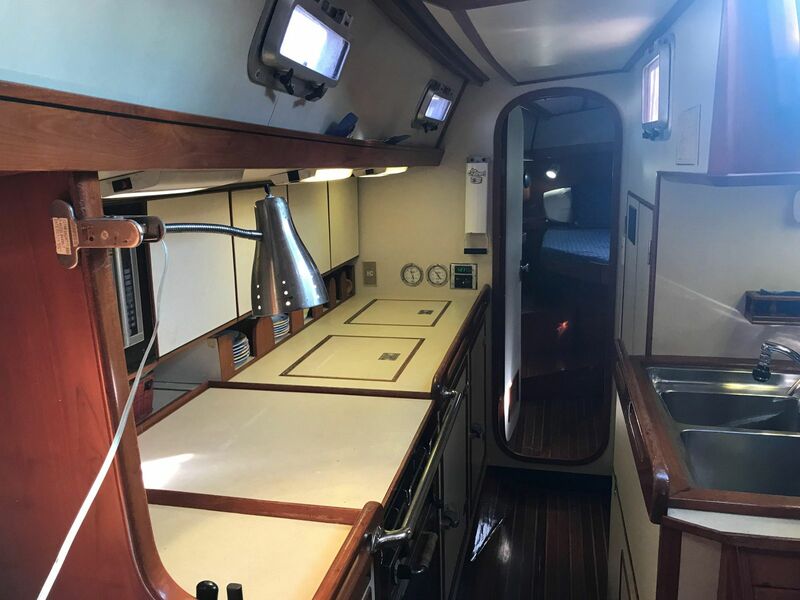 The walkthrough galley is on starboard just aft of the salon. It is a complete galley to please any cookie. Electric fuel pump – Fuel consumption average 1.33 g.p.h. Misc. PFDs, fenders, dock lines, fire extinguishers, horn, etc.